Ahh, I guess most of us, especially female don't really pay a great attention on our both feet compare to hair, manicure or body care. So, we used to have cracked heels due to lack of foot care (like hygienic issue and moisturization) , overexposure, prolong standing posture or even ill fitting shoes. It may causes redness, flaky patches, cracked skin or even worse, bleeding. It's somehow irritating when we are wearing heels, it's definitely painful as both feet hold the load of body weight. I don't really have any big issue with cracked heels as I don't really wear heels or stand that long or over-expose my leg to the water, but my mom do. I always see her sitting at a corner and filing her heels manually. It's sort of time and energy consuming huh. A salon finish at home! Unlike the usual foot file we saw in the market, it's an electronic foot filer which leaves you with smooth feet effortlessly! Operated by batteries, it comes with an I (on) and O (off) giving us the great convenience which is always ready to use, generate the rotating action gentlely and effectively! 1. Remove the cover before use. 2. Turn it on by twisting the silver ring to left (anti-clockwise) and gently glide the roller head over the dead skin for few minutes. 3. Wipe or rinse off the excess dead skin particles. 4. Dry your skin with a towel and apply moisturizer. 5. You're done and leave with smooth fabulous skin. 1. Turn off the pedi kit and detach the roller head from the pedi kit. 2. Rinse the roller head under the tap and dry it with a cloth. 3. Replace the roller and cover. *Noted: They are selling refill pack on the roller head. *available at any Scholl outlets and drug stores. 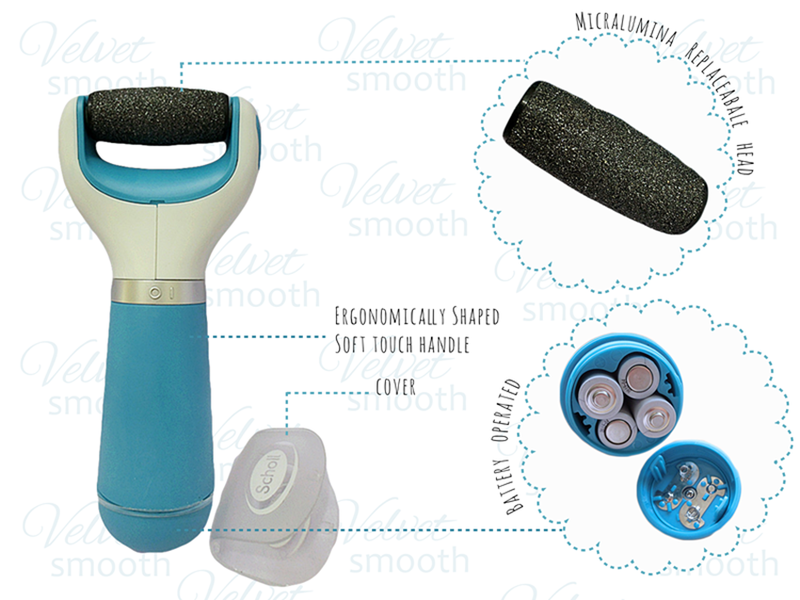 What do you think about it when you first saw this velvetsmooth pedi kit? I wonder what is this and how it works. It looks cool. Do you find it convenient or hard for application? Obviously that it's super convenience in usage as it works only in a click. It does not consume much time and energy. I just need to put it on the preferred area which consists of dead skins. 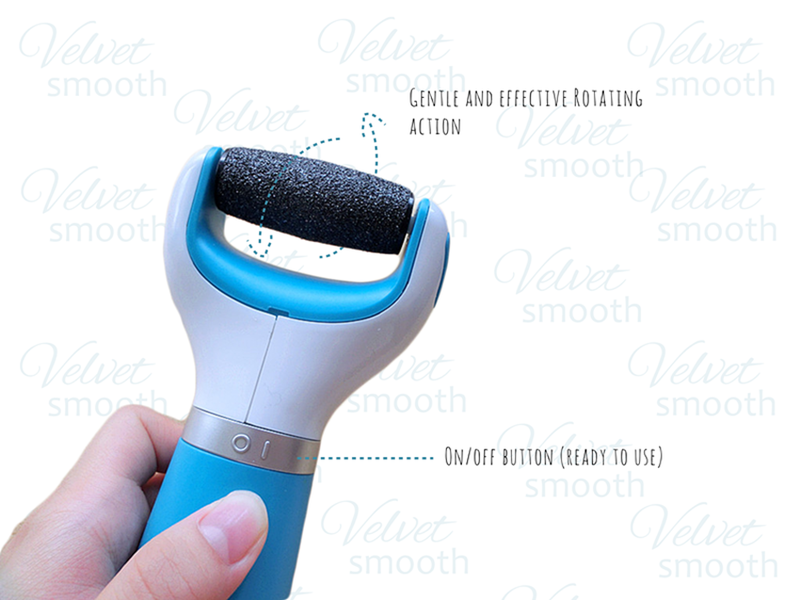 How long you spend to remove your dead skin using velvetsmooth compare to manually operated tool? I spend around 8-10 minutes if using a file tool manually. Yet, I spend only 3-5 minutes using velvet smooth. It's a yes. My feet appeared to be much smooth after using it. I guess I can soon achieve gorgeous feet after long term usage. Do you think the price is affordable for you? It's quite affordable as we are actually paying for the machine and they provide roller head refill pack in the market. What's your rating for velvet smooth or anything to be improved? 4/5. As it's not good enough to fully removed the dead skins and it's kinda noisy. pit stop at 1 Utama, right outside Watson from 6 -10 August for a foot pampering session!